Paul Klee (1879–1940) was one of the most renowned artists to work at the Bauhaus and was both a playful and a radical figure in European Modernism. His intense and intricate work is the subject of a major new exhibition at Tate Modern from16 October 2013, the UK’s first large-scale Klee exhibition for over a decade. Challenging his reputation as a solitary dreamer, it reveals the innovation and rigour with which he created his work and presented it to the public. Bringing together over 130 colourful drawings, watercolours and paintings from collections around the world, The EY Exhibition – Paul Klee: Making Visible spans the three decades of his career: from his emergence in Munich in the 1910s, through his years of teaching at the Bauhaus in the 1920s, up to his final paintings made in Bern after the outbreak of the Second World War. The show reunites important groups of work which the artist created, catalogued or exhibited together at these key moments in his life. 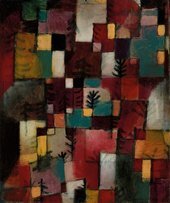 Having since been dispersed across museums and private collections, Tate Modern is showing these delicate works alongside each other once again, often for the first time since Klee did so himself, in a unique chance to explore his innovations and ideas. Born in Switzerland in 1879, Klee started out as a musician like his parents but soon resolved to study painting in Munich, where he eventually joined Kandinsky’s ‘Blue Rider’ group of avant-garde artists in 1912. Tate Modern’s exhibition begins with his breakthrough during the First World War, when he first developed his individual abstract patchworks of colour. The many technical innovations that followed are showcased throughout the exhibition, including his unique ‘oil transfer’ paintings like They’re Biting 1920, the dynamic colour gradations of Suspended Fruit 1921 and the multicoloured pointillism used in Memory of a Bird 1932. The heart of the exhibition focuses on the decade Klee spent teaching and working at the Bauhaus. The abstract canvases he produced here, such as the rhythmical composition Fire in the Evening 1929, took his reputation to new international heights by the end of the 1920s. The 1930s then brought about radical changes, as Klee was dismissed from his new teaching position by the Nazis and took refuge in Switzerland with his family, while his works were removed from collections and labelled ‘degenerate art’ in Germany. Despite the political turmoil, financial insecurity and his declining health, he nevertheless became even more prolific. Tate Modern brings together a group of his final works from the last exhibition staged before his death in 1940. Although he saw his art as a process of spontaneous creativity and natural growth, exemplified by his famous description of drawing as ‘taking a line for a walk’, Klee actually worked with great rigour. He inscribed numbers on his works in accordance with a personal cataloguing system and wrote volumes on colour theory and detailed lecture notes. In grouping these works as Klee himself did, this exhibition presents an extraordinary opportunity to explore them in a new light and understand them as the artist intended. The EY Exhibition – Paul Klee: Making Visible is curated by Matthew Gale, Head of Displays, Tate Modern, with Flavia Frigeri, Assistant Curator, Tate Modern. The exhibition is accompanied by a fully-illustrated catalogue from Tate Publishing and a programme of talks and events in the gallery. EY and Tate have launched a three-year partnership, making EY one of the largest corporate supporters of Tate. The partnership aims to increase awareness, understanding and appreciation of art and helps Tate to realise its ambitious programme across Tate Modern and Tate Britain, including three major autumn exhibitions. Paul Klee is the first ‘EY Exhibition’ in the three-year EY Tate arts partnership, bringing Klee to London for the first time in over decade. He is regarded as a king of European modernism, alongside Matisse and Picasso, and will be viewed by UK and international visitors. EY has always recognised the importance of innovators beyond the world of business, and Paul Klee is a great example of such an innovator among twentieth-century artists. EY has been a supporter of arts and culture in the UK for over 20 years, which not only promotes the importance and value of diverse perspectives and cultures, but also positively contributes to the UK economy.